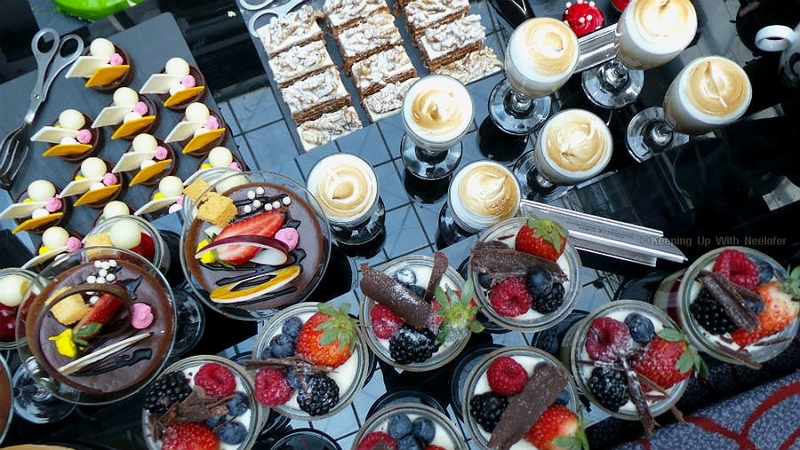 In Dubai brunches are gaining traction like never before. 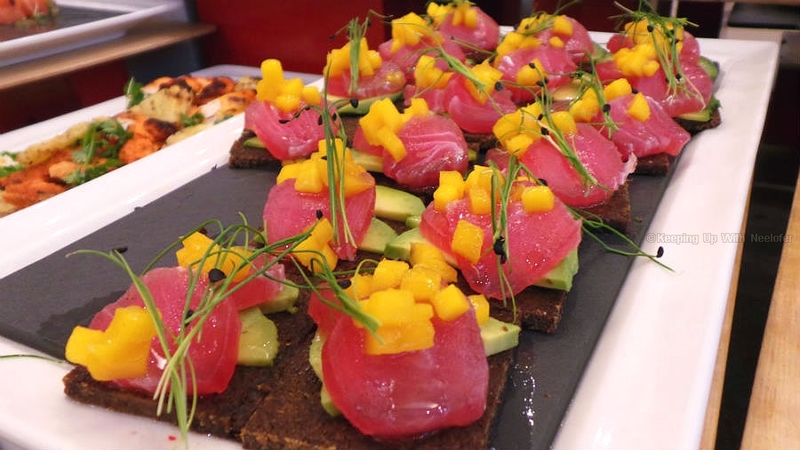 It's crazy how many hotels (and restaurants, alike) have revamped their brunch offering. It's also indicative of the fact that people don't tend to laze around in their PJs at home on days off anymore. Brunches can turn into a good or bad experience and I'm glad to state that I haven't been to a bad brunch. It's purely because several hotels pay close attention to every aspect, more so than ever before making the time spent there, worthwhile. Having said that, I visited the Movenpick Hotel for brunch. The Art of Brunch, as they call it takes place at the Fountain restaurant, every Friday until Dec 31, 2016 and features a plethora of delicious bite-sized and main course meals within different cuisines along with drinks (alcoholic and non-alcoholic). I'm also sending my 4 lucky readers on this brunch so they can experience it themselves! The ambience at the restaurant is pretty relaxed and welcoming. The brunch, surprisingly is a favorite among tourists and residents alike, as the seating area was almost full with only a few tables waiting to be occupied. We started at the salads and appetizers section- I love salads that defy the norm (carrots, olives, tomatores and cucumbers tossed in dressing is so 1990). I was quite delighted to see a variety of eatables on display- it had something for everyone. 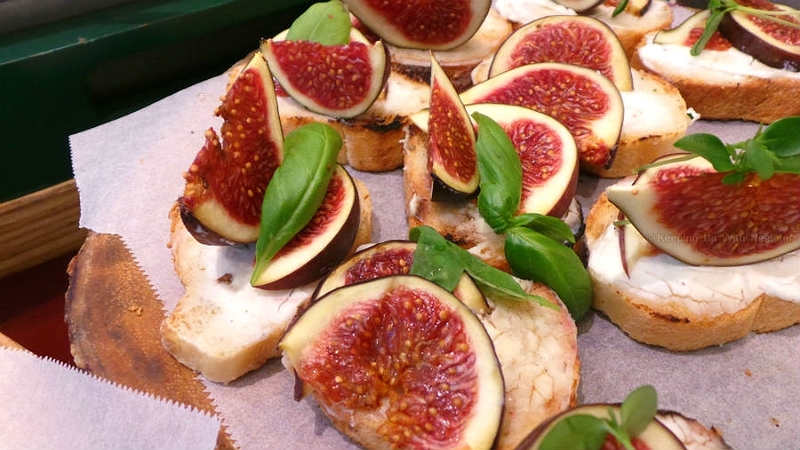 My favorite was the feta and figs on warm Italian bread (pictured below). There was something delicious about combining the slightly salty feta cheese with the sweetness of freshly cut figs. Don't dismiss it- you must try this one. There was a variety of English. Spanish and Arabic salads and appetizers at this section, ranging from the freshly made Moutabal to the spicy chicken strips with grilled pineapple. I found this dish to be particularly interesting. The vivid colors and the avocado made it all the more appealing. The best part? 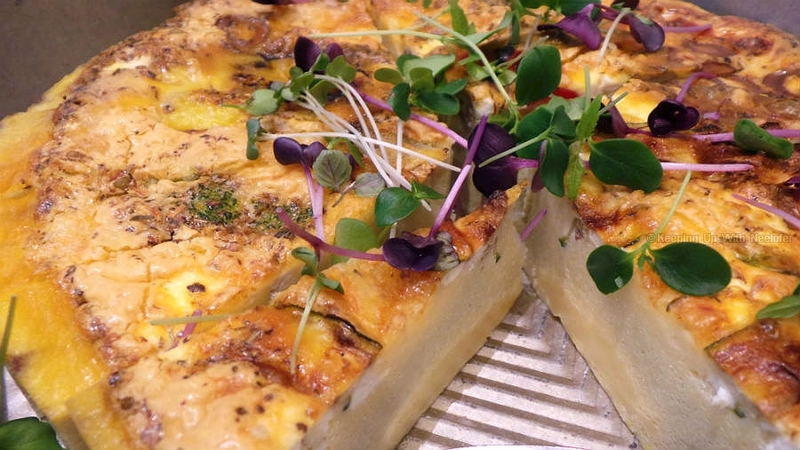 They are made in minutes the chef's kitchen, hence the freshness of every ingredient reflected in the taste. I can't resist a good Arabic spread. From grilled chicken that tantalizing the taste buds to perfectly made hummus- I love it and was glad to see this as part of the brunch. 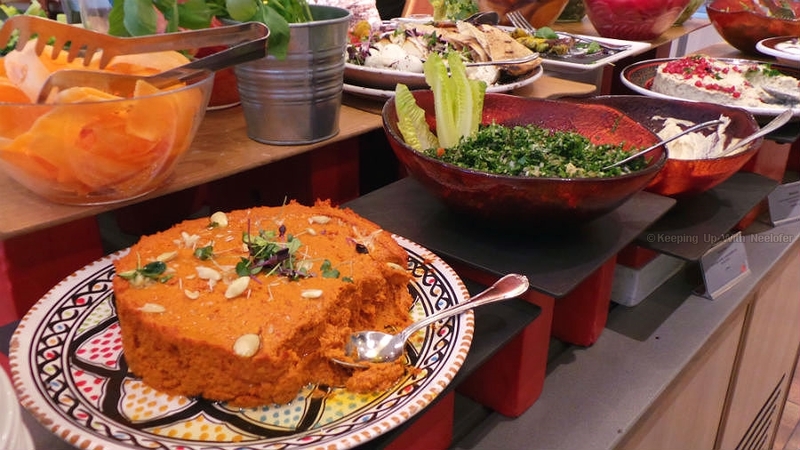 No Arabic salad station is complete without Tabbouleh. I loved how crisp the greens were and this was one of those salads which did not have a generous helping of lemon juice- which is a good thing! 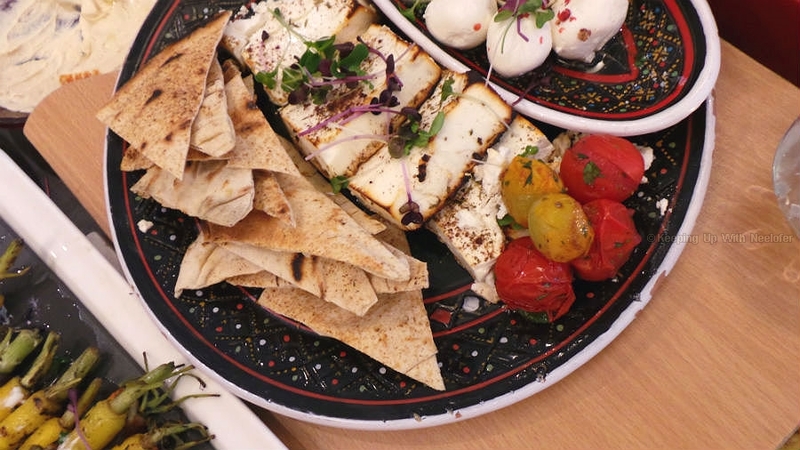 While other restaurants struggle to get Moutabal right, The Fountain has aced it. I did not taste any bitterness within the dish, but a distinct flavor that is prevalent in this traditional dip. 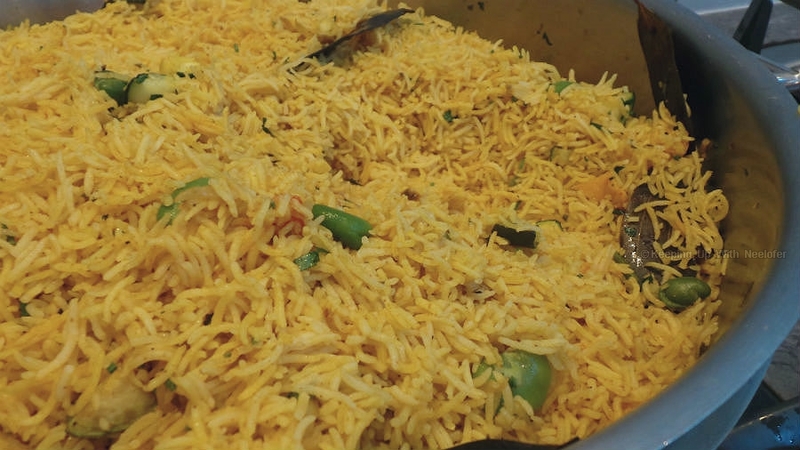 Just like the appetizers and salad section, the main course featured Arabic, Indian and Asian cuisine. The former featured succulent chicken and lamb dishes (incl. Morocco's Lamb Tagine, which was bursting with flavor) along with Harissa Chicken- it's become a firm favorite of mine. The Indian section has a variety of food to choose from- be it fragrant Vegetable Rice or chicken based curries and dishes. I have to speak a bit more about the chicken. 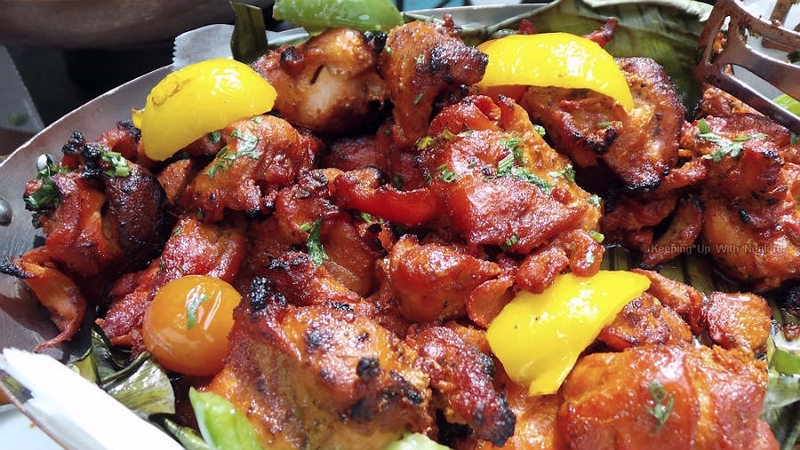 Flavorsome, tender and delicious, this chicken dish was good to eat on its own. I did go for a second helping! Seafood lovers, rejoice! There's a sushi section to suit everyone's taste buds along with other Asian elements such as noodles. There was quite a crowd at this section confirming the fact that the restaurant gets sushi perfectly well. 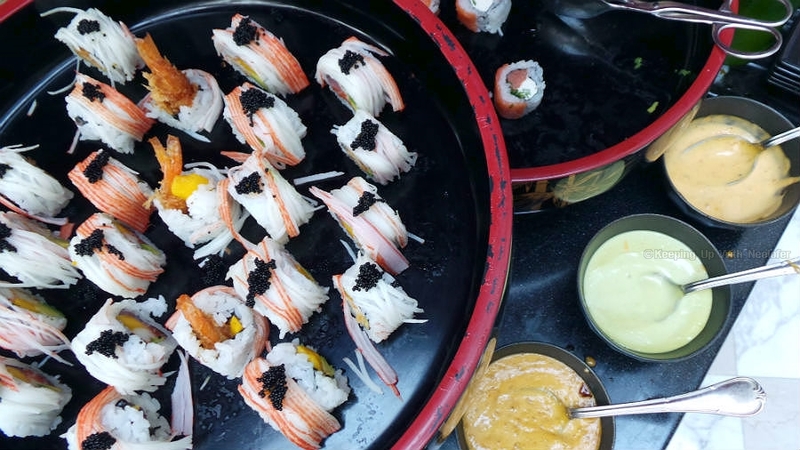 The sushi is prepared in the moment and presented- don't you just love this? You don't have to worry about an upset stomach or stale food. No brunch is complete without desserts! I have a sweet tooth and usually look forward to all things sweet after a meal. 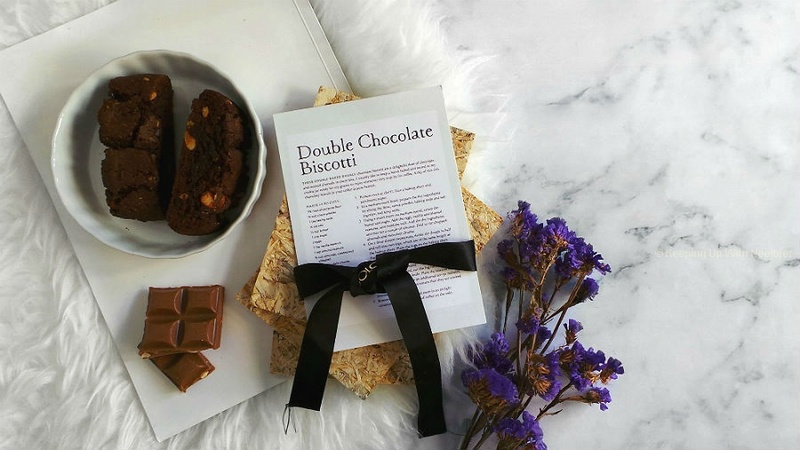 Did you know having a small helping of something sweet helps in the overall digestion of the food? 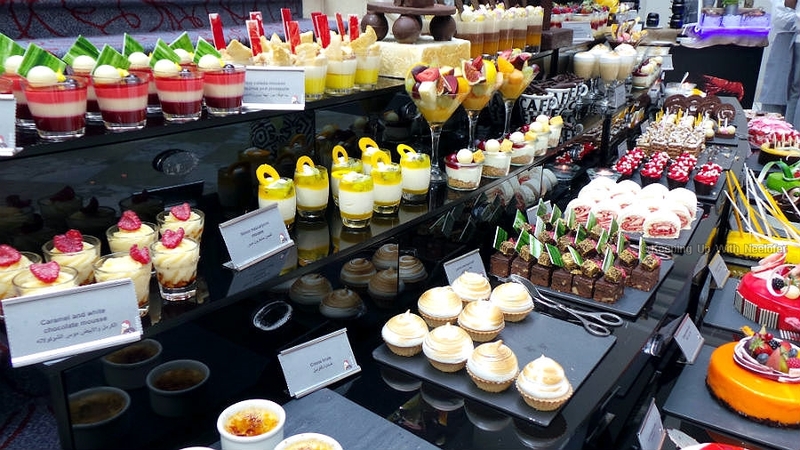 The Fountain Restaurant has a never-ending desserts buffet- alrightm I'm exaggerating a little but you will be spoiled for choice with the variety on display. 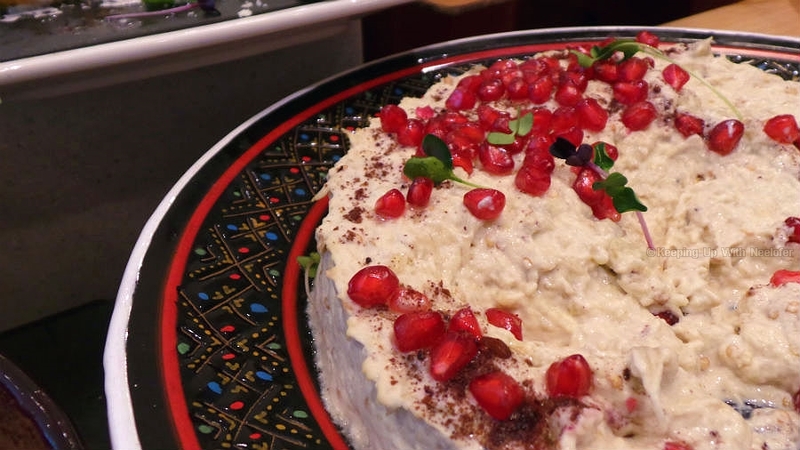 Think Mango & Chocolate Mousse Cake, Strawberry Swirl Cheesecake, perfectly baked Cherry Cupcakes with White Chocolate, coffee based puddings, Mouhalabiya, Rice Pudding With Mango, freshly made Carrot Cakes...the list goes on. 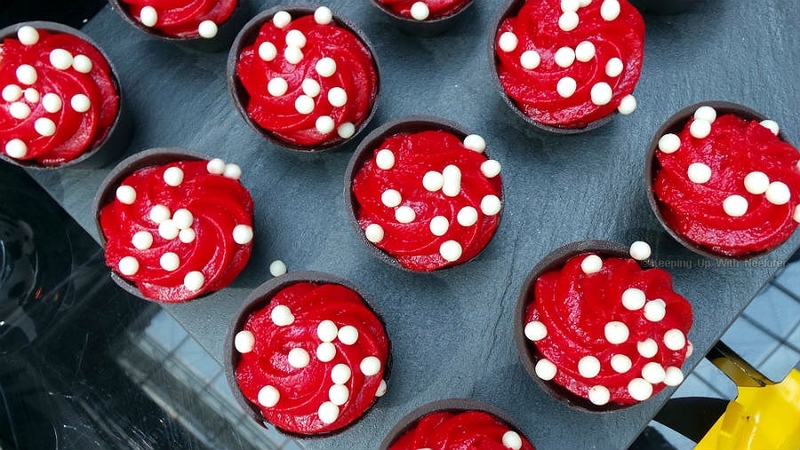 These particular cupcakes were made to perfection- melt-in-your-mouth deliciousness. I'm a fan of cupcakes that have an unconventional pairing and I appreciate the unexpected burst of flavor that makes you yearn for more of it. 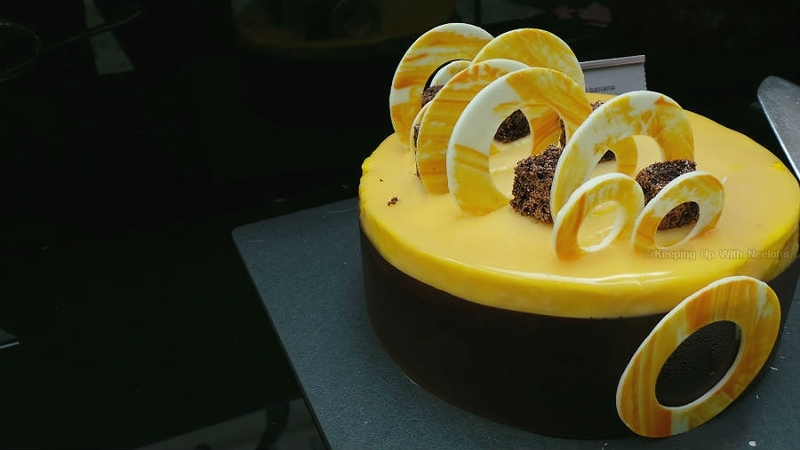 Can we take a moment to appreciate how appealing this Mango & Chocolate Mousse Cake looks? It was equally appetizing and the concoction of fruit paired with cocoa complimented each other well. I have a special place for cheesecakes in my heart ever since I discovered the no-bake cheesecake recipe. Ever since that day, I've made at least 8 different cheesecakes and almost all of them (with the exception of 2) were a success. 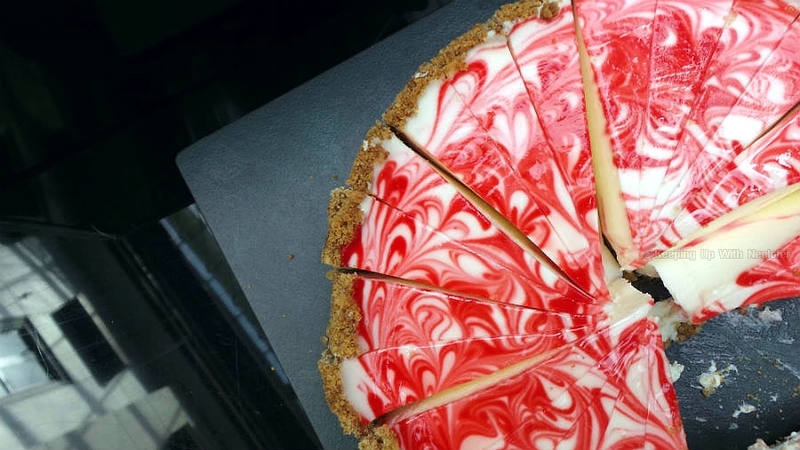 So, when I spotted this Strawberry Swirl cheesecake, I was quite delighted. This cheesecake however, was baked and quite delectable. Brownie points for the smooth texture of the cheese and the sweet & tangy combination of strawberries. I'm in awe of how beautiful the cake presentations looked. I didn't want to cut this White Chocolate Berry Mousse Cake (but someone had to!). The fresh berries combined with the silky mousse made this quite enjoyable. The desserts buffet also had a gummy bear dispenser along with a cotton candy and ice-cream stand It pretty much felt like Willy Wonka's Chocolate Factory! I'm so grateful for the fact that I could walk out of the hotel with a large helping of freshly spun cotton candy and not wait for winter fun fairs (JBR, I'm looking at you) in the city. Fountain Restaurant also houses a separate section for the kids, entitled Kids Paradise- completely under supervision, this area houses a play area along with a kids buffet to keep them occupied while you have your meal. I absolutely loved this brunch and the selection of food. The service was up to par and so was the atmosphere. The Art of Brunch at the Movenpick Hotel located in Oud Mehta has my stamp of approval- I recommend you try it out this Friday. The brunch, available every Friday until end of 2016 is priced at AED 195 per person including soft drinks or AED 295 including house beverages. Kids below 12 years of age eat for free and those between 12-16 years receive a 50% discount. 1) Like my Instagram page (@DarkRangerN) and follow the instructions on the giveaway post. 2) Confirm with a message below mentioning your Instagram handle. Competition open for UAE residents only and the prize must be collected from Dubai. Good luck! Wow!! What an awesome spread. Thanks for sharing your experience. Hope to get a chance to experience the same. Participated through my handler @selro123. Hope to be lucky to win with you. Invited my friends to join as well. Also shared on my competitions page. Link given below. Done ! Instagram - @deanne_braganza ! Done all as described. My IG Handle is: zar2014. Hope to be lucky as its going to be our 10th wedding Anniversary on this 27th. @amnamohammed8 Nice article. Thank you.